Fractional CFO services target companies who have achieved multi-million dollar revenue levels but are striving for a higher level of sophistication and need to add financial expertise to their executive team. Often their finance and accounting team is run by a controller, accounting manager or bookkeeper who may lack the depth of experience to think strategically about the business and will likely also benefit from the leadership that professional CFO brings to the company. Focus, on what really matters. I share with my clients the Homza Value Pyramid. It’s my guideline for how I spend my time as a fractional CFO. Everyone should understand their value pyramid. 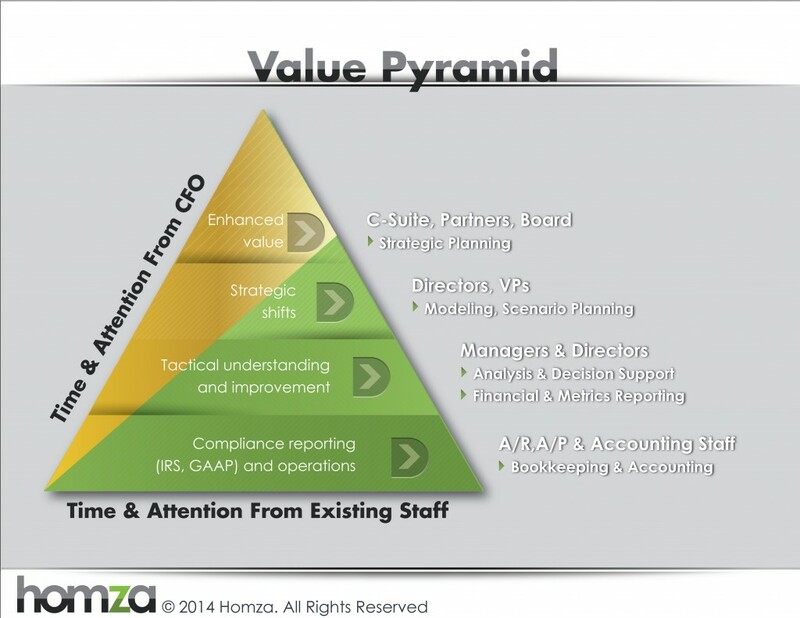 The Homza CFO Value Pyramid is a visual depiction of where I spend my time with clients over the course of a typical engagement. My goal is to spend as much time as possible working with key executives but it is critical that I spend time working at all levels of the pyramid. Often, there is some foundational work that needs to be done before a company can start to move forward. Resolve any foundational issues that might exist in the financial reporting process – too often, companies have a hard time staking out their vision of the future because they don’t have a realistic picture of where they are today. Ultimately, however, it is about outcomes. The outcome goal is always the same – higher profitability and improved cash flow.